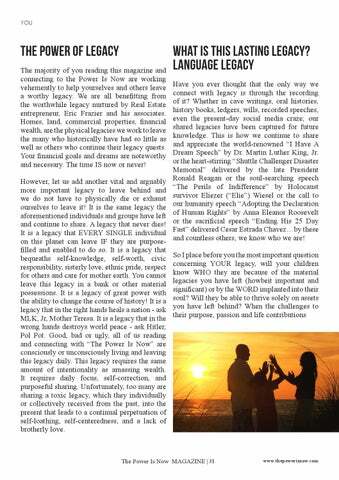 THE POWER OF LEGACY The majority of you reading this magazine and connecting to the Power Is Now are working vehemently to help yourselves and others leave a worthy legacy. 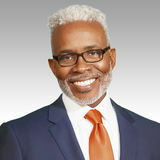 We are all benefitting from the worthwhile legacy nurtured by Real Estate entrepreneur, Eric Frazier and his associates. Homes, land, commercial properties, financial wealth, are the physical legacies we work to leave the many who historically have had so little as well as others who continue their legacy quests. Your financial goals and dreams are noteworthy and necessary. The time IS now or never! However, let us add another vital and arguably more important legacy to leave behind and we do not have to physically die or exhaust ourselves to leave it! It is the same legacy the aforementioned individuals and groups have left and continue to share. A legacy that never dies! It is a legacy that EVERY SINGLE individual on this planet can leave IF they are purposefilled and enabled to do so. It is a legacy that bequeaths self-knowledge, self-worth, civic responsibility, sisterly love, ethnic pride, respect for others and care for mother earth. You cannot leave this legacy in a bank or other material possessions. It is a legacy of great power with the ability to change the course of history! It is a legacy that in the right hands heals a nation - ask MLK, Jr, Mother Teresa. It is a legacy that in the wrong hands destroys world peace - ask Hitler, Pol Pot. Good, bad or ugly, all of us reading and connecting with “The Power Is Now” are consciously or unconsciously living and leaving this legacy daily. This legacy requires the same amount of intentionality as amassing wealth. It requires daily focus, self-correction, and purposeful sharing. Unfortunately, too many are sharing a toxic legacy, which they individually or collectively received from the past, into the present that leads to a continual perpetuation of self-loathing, self-centeredness, and a lack of brotherly love. The Power Is Now Inc.